Dental implants are one of the options for the restoration of lost teeth. These implants are very small titanium posts (the same materials used for other surgical implants, such as repairing severely fractured bones). The posts are surgically placed into the jaw, where they fuse with your bone structure to create a foundation for artificial teeth—essentially, creating a titanium “root” for your new artificial teeth. Because the posts are fused with your jaw, the teeth attached feel and function just like your natural teeth. They can provide a more stable structure for your jaw and face, prevent deterioration, and allow you to eat and speak exactly as you would with regular teeth. If this is the choice you make for replacing missing teeth, we’ll perform a radiographic exam to ensure the integrity of your jaw and identify important nerves and structures, and ask you series of health and history questions. When we know that you’re a good candidate for the surgery, we’ll refer to you an Oral and Maxillofacial Surgeon or a Periodontist to perform the implant surgery. 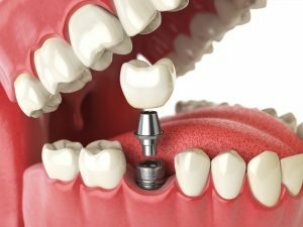 Depending on the type of implant and your jaw health, artificial teeth can be placed onto the implants either immediately, or after allowing your tissues to heal and the bones to fuse with the implant, anywhere from 2-6 months. Because this procedure is more complex and specific to each patient, we encourage you to come in for an evaluation and visit with our staff to answer any questions you might have.